Some of you guys may have seen the thread in 2003 (well before my time) but I just came across a fantastic and idiot-proof method for lowering our E55 "high front / low rear" factory suspension for 80cents and 20 minutes of your time. It beats the $2000 electronic lowering kits from every tuner in the world! Originally done by guys like EPower and tbone (E500 from E-Class Forum) ...thanks a lot fellows! For those of you who would rather keep the 2 grand for two sets of new tires or an "inexpensive" diamond ring for your lady, here goes: lift the front end with a jack to expose the aluminum suspension and air spring (no need to remove the wheel). You will see a double lever sensor attached to a metal bracket at the top. Undo the top 10mm nut and remove the small grey bracket with the articulated sensor still attached by a ball-joint. Place 5 to 6mm / 1/4 " worth of small washers under the bracket and re-fit in the reverse order. There isn't enough thread to place any more washers or the nut will not thighten up and you might strip it. Those 6mm will translate into 20 mm drop at the front wheels when you turn on the engine! In essence, you are fooling the Airmatic DC into believing that the car is sitting 20 mm too high and it will lower itself by the self leveling suspension and stay lowered for as long as the washers are in place. This is a completely reverseable mod. I read the 2002/2003 thread last night, could not believe my eyes and did the job first thing this morning. I now have a totally balanced front and back with exactly identical clearence around all four weels. Handling and turn in has improved as the heavy front of the car dropped the centre of gravity by 20mm, but the ride comfort is unchanged. Once inside, you will immediately notice the new lower front aspect of the car and reach for the seat adjustment to stop "leaning forward". You can also raise the car by the usual "Raise" button and, stangely enough, it goes up to within 10 mm (rather than -20mm) of it's previous "SUV" setting, so it finds another 10mm somewhere. will try it this weekend!! please post your results and a pic if possible (before and after). So this is only done to the front not the rear? I presume this is a non-load bearing part of the suspension? If the washers 'failed' it could get ugly. Can you pot some pictures please? Well speaking for Rafal (his son), I can tell you this is not a load bearing mechanism. It could only fail if the nut wasn't tightened. Yes, this is just for the front. There is apparently a single sensor at the rear. near the sway bar, controlling both rear wheals but since I didn't need any more than 20mm at the front, there was no point fiddling with the rear. Front and rear are now almost equal clearance around the tyres. When you lift the front wheel, you will see what I mean. 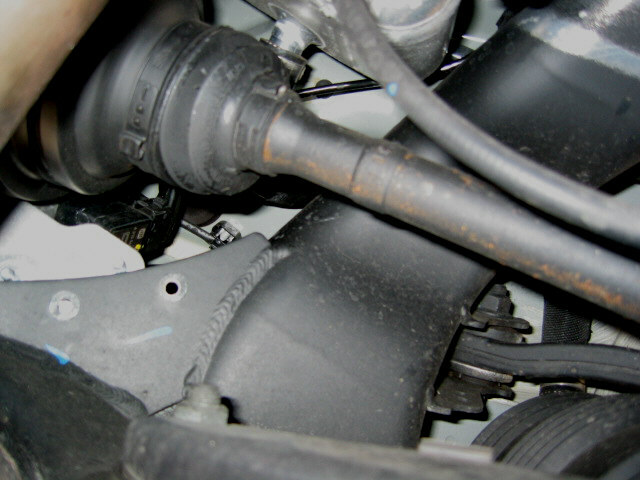 There is absolutely no load as this is only a sensor, attached to the air spring suspension component. The washers have a bolt stuck through the middle of them, so they are not going anywhere as long as you re-tighten the top nut - leave enough thread! Your camber will increase by 0.2 degrees or 10% ie. 0.1 deg for every 10mm drop. You could do wheel alignment if you are concerned about inside tyre wear. Ride is a little firmer (understandably) so 40psi on the front is probably a little too ambitious for Sydney or New York pot holes. Try it, if you don't like it, you can undo it in 15 minutes. PS. How do I post the pictures? I have heard horror stories about washer lowering on airmatics. 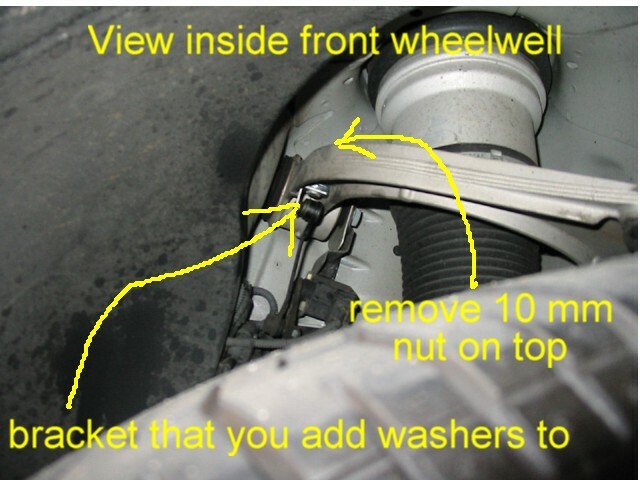 The washer doesnt allow the bolt to lock on and in the end the bolt comes off and your suspension drops to the ground. My buddy did this and he heard about this issue and made the change just in time. The bolt was loose and it if came off the entire assembly would have failed. This type of lowering have been around for a while and there is a reason why its not so popular. Bottom line... save $2k on a lowering module today, pay $4k for new hydro-pneumatic struts later. Give me your buddy's address, I will send him some Red Loctite. If you do not know how to tighten a simple nut, then you may be right. But for most of us who know how to tighten a nut, then it is a simple, foolproof way to lower your W211. I pretty much perfected this method a couple of years ago on my E500, put 60,000 miles on it, and it looked and rode perfectly...didn't even need a camber kit. Just picked up my new Black '05 E55 last week, and this was basically the first thing I did on the new car. I do not agree with Rafal in that he is not lowering the rear of his car. It may look even when looking at the "gap" from the top of the tire to bottom of the fender, but the car should be lowered equally in the rear to get a balanced ride. The rear is a bit more diffucult to do, but worth it. The sensor nuts are harder to find and even harder to Dremel out the appropriate slot due to the Drivers side exhaust kinda being in the way...but I did it with a little patience. It was way easier on my old E500 in the rear. I only lowered the E55 .5 inches, or about 13mm. I lowered my E500 a full inch, or about 25mm. Seems to me the E55 rides about .5 inches lower to begin...maybe not. Try to post some pics of the new ride soon. 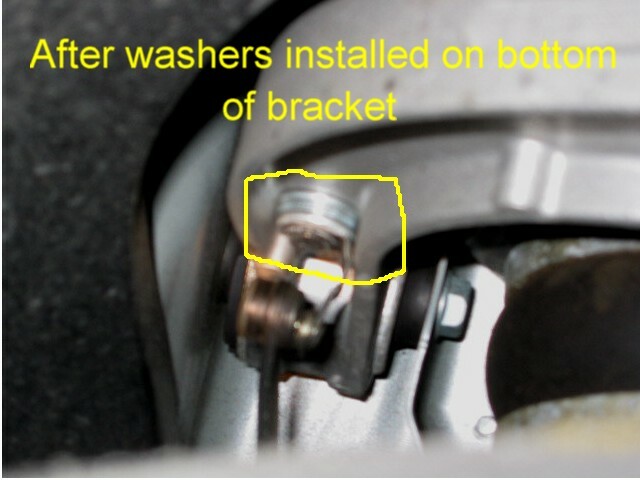 Its obvious that you have to ensure that there is enough thread left on the bolt installing the washers and that the nut is re-tightened properly.I coverd this it in detail , 5 mm is the limit, or you can buy new brackets from TWS with longer thread and more adjustment. Any modification which involves undoing bolts and nuts is potentially hazardous. (is there one that does not?) The same is true if you change your flat and fail to re-tighten the 5 wheel bolts. You lose not just $50 worth of bolts but $80k car as well. In reality, almost everyone here has this constant urge to "improve" what essentially is a pretty amazing paskage. Loctite sounds like a great idea. 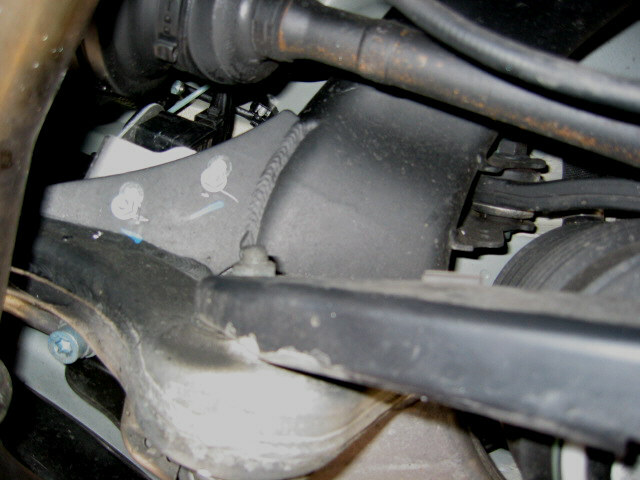 EPower, I dont really understand your photos of the rear bracket. Is that triangular piece which is welded on two edges sitting in a vertical plane? By slotting the holes do you re-mount the bracket closer or further from the ground ( I assume the slots are made perpendicular to the ground)? And how many mm/inches do you move the sensor? Also, it looks like you slotted the holes then have filled them with something - doesnt a nut and bolt go there? Thanks, I might try this mod. Yea, it is difficult to really understand from the pics. You just have to slide up under the rear axle, middle driver side, and look for the two nuts, since that is basically all you can see at first. The mounting surface is not completely vertical, but at an angle. You slot the holes CLOSER to the ground. As for how far, it depends on how much you want to lower. It takes VERY little movement of the bracket. On the E55 I only slotted it about a quarter inch. These pics of my E500 are probably closer to 3/8 of an inch...again, not much movement. I did not fill the slots with anything, just inserted the bolts on the sensor mounts in the new, lower position. Then just tighten nuts firmly and the sensor bracket stays in place. There is really no tension or torque on these brackets, so movement once remounted is not an issue. The great part is that if you want to adjust to several different positions, front or rear, it is easy to do. And if you don't like the results at all, it is easy to put back to stock. many people overlook the fact that the front fenderwell arches are cut higher than the arches in the rear this gives the illusion that the front is sitting higher than the rear when actually there is a slight rake towards the front,part of this is due to the rear tires being a bit taller in the rear as well. Another issue is that washer thickness varies considerably. Think that a few thousandths of an inch in thickness can make a noticeable difference in the level of your car. Might be worth it to seek out some precision washers rather than hardware store variety for this, or at least mic the washer thickness if you're going this method (which I agree is not preferable). Although I agree about the fender well arches, I am not sure which E55 you are talking about. Every E55 since 2001 comes stock with tires that are taller in the front than in the rear. Many aftermarket setups still preserve this difference. my mistake,had it backwards. fronts are .5" taller than the rears. I agree with the washer thickness issue. I measured each of 20-odd washers individually with a digital vernier caliper and they varied from 1.18mm to 1.71 mm from the same box. Just mark them and pick the ones you need to make up 5-6mm in total (or less). You will get x 3.2 multiplier effect from the suspension.I also used a flanged stainless nut with the same thread (from 8mm Dyna-bolt) which was 1.5 shallower to use less thread at the top. This is a great mod if done correctly. You should do both front and rear and your car will handle better with the lower center of gravity and look AWESOME! I have has several Porsche owners and both local MB dealerships just say how the car should of came from the factory with this look. BTW - If you want to see my car go to the above site an look under customer cars. You will see about 11 pics from various angles on how our E55's look lowered with 19" rims. Last edited by 04E55 AMG; 05-08-2005 at 10:09 AM. EPower was right. I just lowered my rear suspension by 11mm (3.5 mm notch with the same x3.2 multiplier as the front sensors=same leverage) and the front crept up by 2mm as a result of the weight shift to the rear. My car handles and rides better than ever and looks fantastic. Even the stock 18" wheels look larger now that all the rubber has disappeared into the wheel well with hardly any head space above each wheel. I am looking at 19" Carlsson 1/16 Brilliant Edition or the three times more expensive 1/16 Ultra Lights. Has anybody used either of them? I am worried about getting a correct tyre for the rear 10" wheel. 285/30 is ideal but almost impossible to get. 275/30 is narrower than the rim and 295/30 is so wide that ot might rub the guards unless I get ET45 offset (CL-Class). Do you have more pictures of the bracket holding the sensor at the front? Your last picture and the one before it seems to have different looking brackets, one is a 90 deg. bracket and other seems a little different. Is there a reason for different ones?